Free download Colin McRae Dirt 2 game for PC. It is a rally racing game developed by Codemasters in 2009. Colin McRae Dirt 2 is American approached off road car racing game. You can enjoy the amazing movement of rally racing game around the world. There are five racing disciplines in Colin McRae Dirt 2 racing game. You can play all offline as well as online. There are also added three special modes in Colin McRae Dirt 2 game. The five racing disciplines include Rally, Rallycross, Traiblazer, Raid and Landrush. In Rally racing, the race will start on non circuit roads. These roads are closed for people so there will be no public on the road during this discipline. In this race, you will also have a co-driver with you. You have to complete the stages with clock competition. In Rallycross races, your race will depend on circuits along with laps. The cars are specified that are used in rally events. There are total eight racers in this mode. In Trailblazer discipline, your car will climb on hills. This mode is also has stages just like rally. The cars are very specified and with features suitable for hill climbing. The Raid discipline, there are up to eight competitors with heavyweight vehicles. 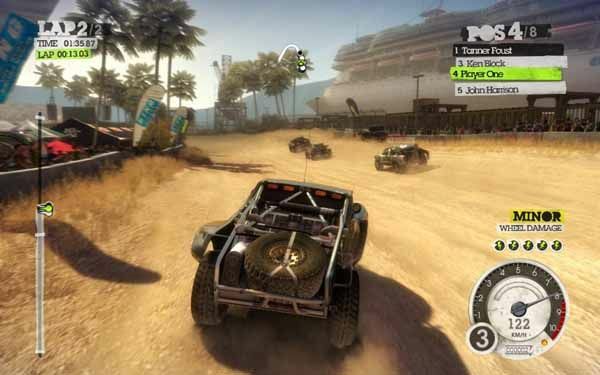 The vehicles are trophy trucks and buggies types in this mode. The track of this race has an average length of 5 km. Landrush is very similar to Raid but enclosed in circuits. There are eight racers in such kind of race. The track length is 1 km and has multiple laps.